The Weslo Cadence R 5.2 treadmill came on the market in October 2012. It’s compact design and easy storage makes it ideal for home use. It is equipped with Comfort Cell Cushioning to absorb impact and eliminate stress on the knees and joints. The Cadence R 5.2 provides cardiovascular workouts for all fitness levels. It is capable of speeds up to 10 mph and performs well for walking, jogging and running. Six preset workouts designed by a professional trainer are included. The treadmill is durable and feels solid even at high speeds. The Cadence R 5.2 treadmill is also moderately priced. It can be purchased from Amazon from $288.26. The Weslo Cadence R 5.2 treadmill is constructed of high quality materials. 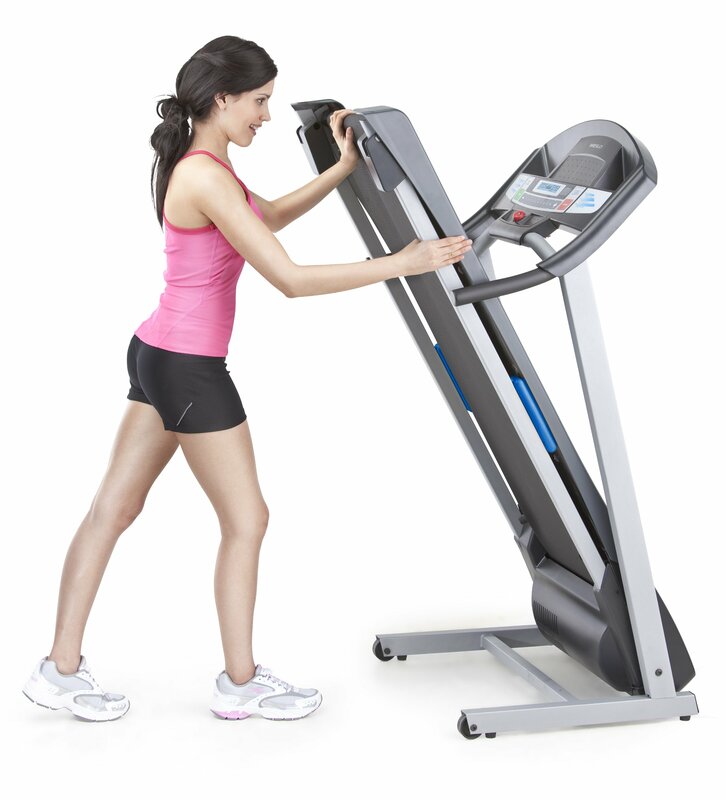 The steel frame provides durability, and the treadmill remains stable while running at high speeds. It doesn’t rattle or shake during high intensity workouts. The deck is quite sturdy and capable of holding up to 250 pounds. The belt is uniquely designed to protect against impact and prevent injury to joints. The cushioning in the belt provides substantial comfort during workouts allowing users to build endurance. In addition, it is sealed with a polymer coating to make it resistant to wear. Its 2.5 HP motor is built for longevity. The motor cools internal components during operation to prolong their life. It provides consistently robust performance even when the treadmill is inclined. The console of the Cadence R 5.2 has a number of outstanding features. It displays time, speed, resistance and the number of calories burned. The console is easy to reach during workouts and includes one touch speed adjustments. Contact heartbeat strips on the handle bars measure the user’s pulse and are displayed on the console. Six preset workouts designed by a certified fitness expert are included in the memory. Three of the programs are designed for weight loss and three for endurance. The system allows these programs to be modified by the users. The speed may be adjusted higher or lower at any time during the workout. Users can also display a graphical representation of their workout. The LCD display has blue back lighting which makes it attractive and easy to read. The Weslo Cadence R 5.2 treadmill requires some assembly but is relatively simple to put together. The time required to assemble it is usually about 20 minutes. The only tools required are a Phillips screw driver and a hex wrench. The hex wrench is included with the treadmill. An easy to follow instruction manual is also provided. The treadmill can be folded up and includes wheels to allow it to be moved effortlessly. This makes it compact and easy to store to conserve space in the home. A magnetic safety clip will immediately stop the treadmill when detached to help avoid injury. The 16 inch x 50 inch belt is a bit shorter than average and may not be adequate for very tall users with a long stride. In addition, the handlebars are positioned comparatively low and are not adjustable, requiring those of above average height to bend to grasp them. The display that tracks the amount of calories burned is an estimated value derived from an average weight. It doesn’t have the capability to enter the user’s weight for truly accurate calculations. The treadmill’s motor can become loud when operated at higher speeds. The incline is adjusted by folding the legs of the treadmill up. Furthermore, the incline adjustment doesn’t provide many options for variation. Changing the incline must be performed manually, and there is no means of adjusting it in mid-workout. The Weslo Cadence R 5.2 treadmill is an exceptional value. It is a durable, high quality machine that is unmatched in its price range. Although the Cadence R 5.2 treadmill does not have many of the features included with more expensive models, the performance and reliability are comparable. Among those in its price range, the treadmill offers an advanced design with an abundance of useful applications including preset workouts, pulse readings and one touch speed adjustments. It is safe and effective for users of all ages and fitness levels. The compact design and wheeled base offer an outstanding space saving feature. The treadmill can be folded up and stored when not in use. The Cadence R 5.2 is built to last. Its 2.5 HP motor is engineered to prevent exposure of internal components to heat and wear. The frame is sturdy and provides stability during intense workouts. The Weslo Cadence R 5.2 treadmill is an outstanding choice for those on a budget. It offers superior quality, a variety of features and is ideal for home use. All parts, labor and the motor are warrantied for 90 days.